Mark Hilden, 24 was sentenced to two and a half years in jail following a high-speed car chase with police. A baby was onboard at the time. Officers investigating a serious assault on the M27 at Nursling are asking drivers who may have seen what happened to contact them. Hampshire Police were called at 11:46 am this morning to a report of a serious assault on the hard shoulder of the M27 westbound between junctions 3 and 2. It's believed the dispute followed an incident involving two vehicles, a red VW Golf estate and a silver VW Amarok. A 46 year-old man has been taken to Southampton General Hospital for treatment to a serious head injury. A 27 year-old man has been arrested on suspicion of assault and a 36 year-old man has been arrested on suspicion of affray in relation to this incident. One lane of the carriageway was temporarily closed to allow an investigation to take place to establish what had happened. The lane closure has subsequently been lifted and enquiries are ongoing. Police in Hampshire are dealing with an overturned vehicle on the westbound carriageway of the M27 at Bursledon. The westbound entry slip road at Junction 8 is closed and delays are building up in the area. Slow traffic and one lane closed due to accident on M27 Westbound between J8 A3024 (Bursledon/Hamble) and J7 A334 / B3036 (Hedge End). 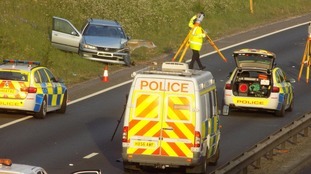 Hampshire Police say the victim of a two-car collision on the A31 overnight was a 22 year old man from Ringwood. He was driving a Peugeot 406 which collided with a coach at Poulner Hill on the A31 westbound, at 2.15am on Sunday morning. The man suffered fatal injuries and died at the scene. The road was closed for several hours as officers carried out their investigations at the scene to establish exactly what happened. They are appealing for any witnesses to the incident or who saw either vehicle prior to the collision to come forward as they may have vital information. BREAKING: All lanes are now re-opened following a fatal crash in Hampshire overnight. A major road closure has been lifted following a fatal collision on the A31. One person was killed when a Peugeot and a bus collided just before 2.15am. Long diversions were in place as police investigated the crash. One person has died following a crash on the A31 overnight. The road is still closed with long westbound diversions through the New Forest. The Eastbound M27 near Cadnam in Hampshire will remain closed this morning as police investigate a high speed collision involving three squad cars. The police vehicles were damaged during a pursuit to stop a black Honda Accord which had failed to stop after it was seen driving dangerously causing a risk to other members of the public. The collision took place at 2am after the Honda Accord came into contact with the police vehicles. The carriageway has been closed between Junctions 1 and 2, with diversions in place towards Southampton through Totton. The driver of the Honda Accord, a 58 year-old man, has been arrested on suspicion of dangerous driving, failing to stop, and driving while under the influence of excessive alcohol. He has been taken to Southampton General Hospital to be checked over for his injuries. An investigation at the collision site is expected to last for the rest of this morning and the matter will be referred to our Professional Standards Department as per standard procedure in due course. The east slip road at junction 9 of the M27 at Whiteley is closed because of an overturned trailer. Recovery is at the scene but drivers are warned that closures will remain in place for some time as it's a complicated recovery operation.